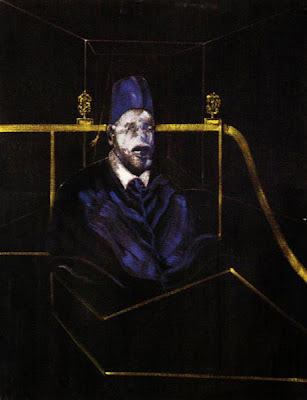 Francis Bacon was born in 1909, Dublin and died in 1992, Madrid. 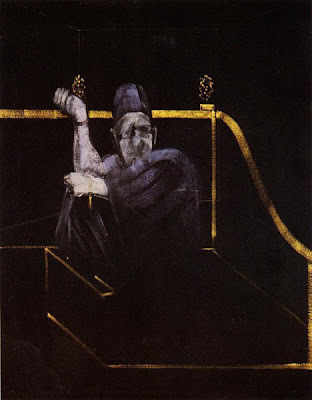 British painter whose powerful, predominantly figural images express isolation, brutality, and terror.The son of a racehorse trainer, Bacon was educated mostly by private tutorsat home until his parents banished him at age 16, allegedly for pursuing his homosexual proclivities. Self-taught as an artist, he drifted in Berlin and Paris before settling in London in 1928, after which he worked as an interior decorator. 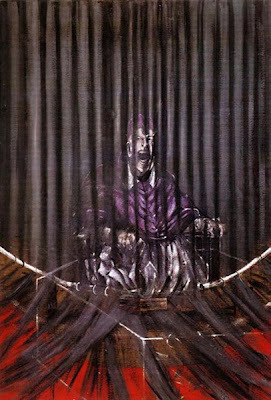 He had also begun painting, though he did so without recognition until 1945, at which time the original and powerful style displayed in such works as “Three Studies for Figures at the Base of a Crucifixion” (1944) won him almost instant notoriety. 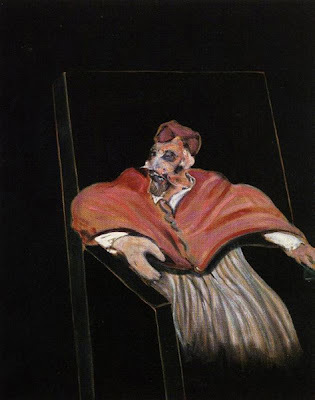 His mature style emerged completely with the series of works known as “The Screaming Popes” (1949–mid-1950s), in which he converted Diego Velázquez's famous “Portrait of Pope Innocent X” into a nightmarish icon of hysterical terror.Many of Bacon's early paintings are based on images by other artists, which he distorts for his own expressive purposes. Examples of such themes are the screaming nanny from Sergey Eisenstein's film Potemkin and studies of the human figure in motion by the 19th-century photographer Eadweard Muybridge. 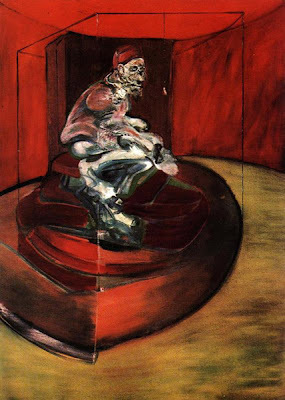 Most of Bacon's paintings depict isolated figures, often framed by geometric constructions, and rendered in smeared, violent colours. He was admired for his skill in using oils, whose fluidity and mysteries he exploits to express images of anger, horror, and degradation. 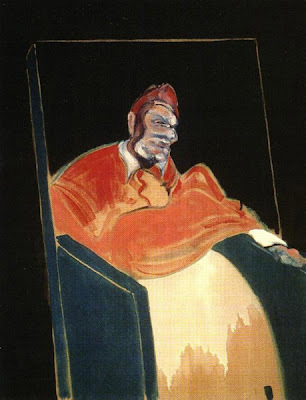 His later portraits and figure paintings are executed in lighter colours and treat the human face and body in a style of extreme distortion and contortion.Bacon's devotion to his art stood in curious contrast to his subject matter and the eccentric squalor of his personal life. 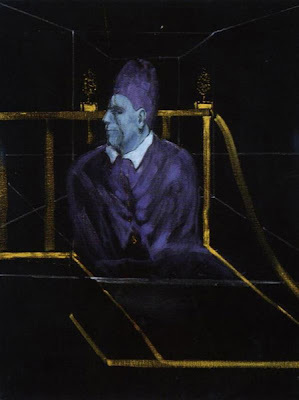 Because he destroyed many of his early works, only a few examples can be found, mainly in American and European museums. 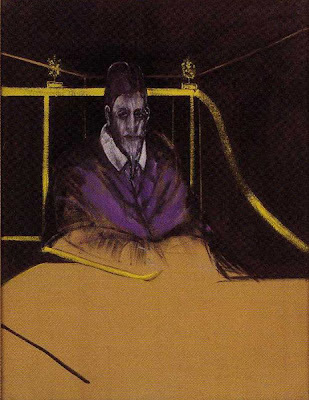 Francis Bacon, arguably the preeminent British painter of the twentieth century, was also for forty years the most controversial. 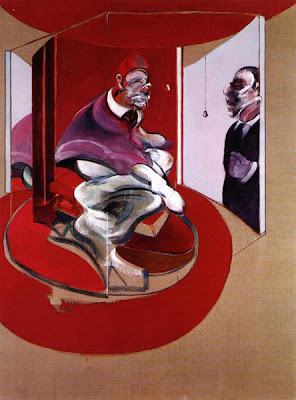 Bacon's art often appears deliberately disturbing. His subject was the human form. 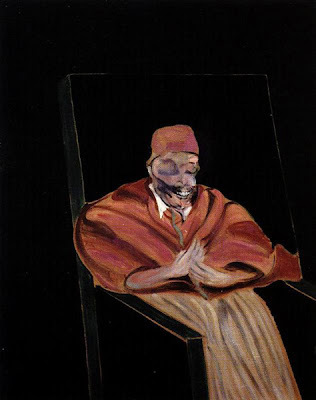 Bacon reinterpreted the physical construction of the body with a new and unsettling intensity. To him it was something to be taken apart by the artist's penetrating gaze and then put back together again on canvas. 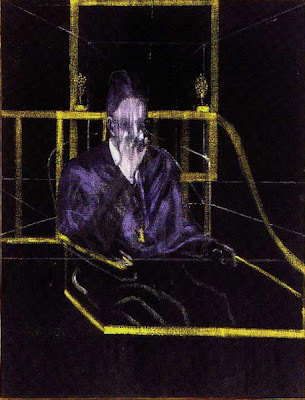 He forces us to see, perhaps for the first time, the separate shapes and stresses hidden in the familiar human figure. 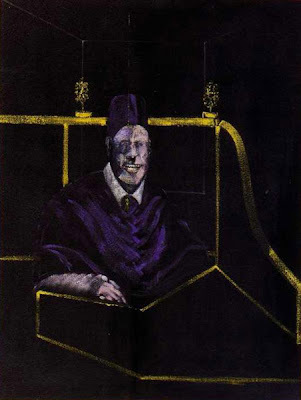 The first trace in Bacon's work of the portrait of Pope Innocent X by Velazquez. 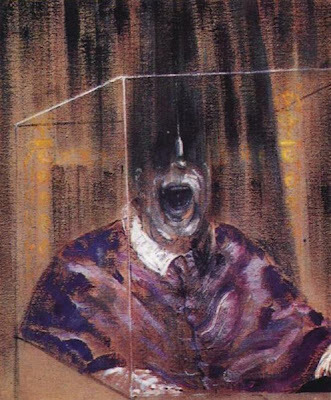 The primal scream is the outstanding motif of these first canvases, where nearly the entire face disappears in shadow, leaving only the mouth that utters the cry. 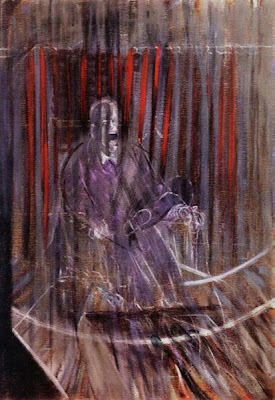 The background is a sort of curtain of shadows from which the figure emerges. 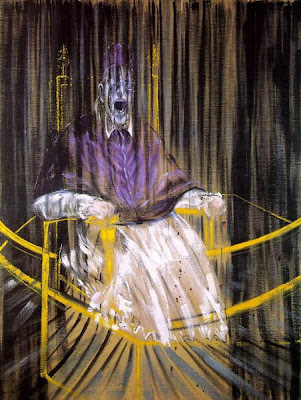 The veil placed between the viewer and the figure of the Pope crying out derives from the textures of X-ray plates that Bacon often utilized in those years. The open mouth can be understood also as the result of a relaxing of the jaw that occurs in cadavers, which would well suit the spectral aspect of this figure. 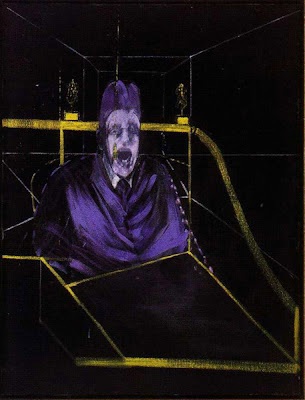 A later version of the Velazquez theme where the cry no longer appears. 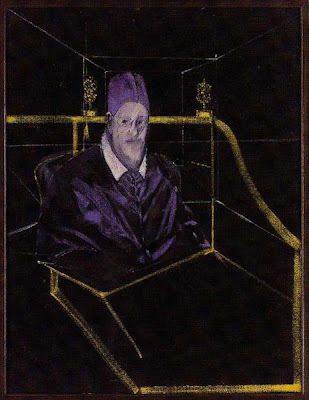 The color has become lighter, and the spatial arrangement already characteristic of Bacon is present in all its elements: the transparent cage, the perspectival space that leaves the foreground empty, drawing the viewer in. Finally, the papal throne has been synthesized into simple volumes. Your blog is rich insight into the artistic world. a pleasure to come by it.